By Francine Prose, Yale University Press, 211 pp. Best-selling author Francine Prose, known for nonfiction titles like Anne Frank: The Book, The Life, The Afterlife, and Reading Like a Writer, wrote a heartfelt biography of Peggy Guggenheim, influential art collector, and early promoter of Modernism in America. Well-ahead of her time, Peggy developed a taste for the avant-garde and unconventional that followed her throughout the entire life. She altered the course of art history in an unprecedented manner by meticulously pursuing new styles and supporting emerging artists. Born in New York City in August 1898 to a wealthy family, Peggy Guggenheim developed an interest in art at an early age. Her father, Benjamin Guggenheim, perished on the Titanic in 1912, leaving Peggy with a comfortable inheritance. 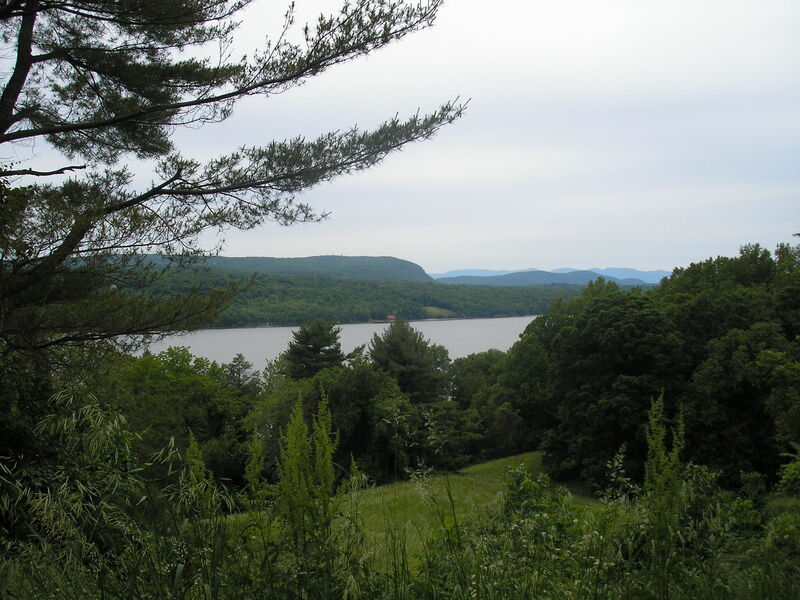 Her mother Florette Seligman, who came from a prominent banking family, also left Peggy with a considerable inheritance, allowing for a sophisticated, privileged lifestyle. “A Guggenheim, or a Strauss, or a Seligman was expected to be meticulously well mannered and to avoid anything that might be considered ostentatious or vulgar,” explains Francine Prose in her biography of Peggy Guggenheim (p. 37). As a child, Peggy traveled frequently to Europe with her mother Florette where they stayed at stylish hotels, and learned about art, French history, British literature, and German opera, explains Prose. In 1920 Peggy moved back to Europe, “in a frenzy to see great art.” “She knew where every important painting was located and insisted on seeing them all” (p. 60). From 1922 to 1928 Peggy was married to Laurence Vail, a French-born American playwright, novelist, and painter who belonged to the Dada movement. Peggy’s life, relates Prose, had “periods of intense travel interrupted by interludes during which she established and oversaw large bohemian households in Paris, in London, and in rural beauty spots in England and France” (p. 17). After her failed marriage with Vail, Peggy engaged in notorious affairs with playwright Samuel Beckett, sculptor Constantin Brancusi, and Surrealist painter Max Ernst, whom she married in 1941 – the marriage would end in divorce five years later. Peggy’s uncle Solomon Guggenheim, who also was an avid collector of modern art, might have been an inspiration to Peggy: Solomon and his mistress, artist and art advisor Baroness Hilla von Rebay opened The Museum of Non-Objective Painting in New York in 1937 to display Solomon’s growing collection which included works by Kandinsky, Chagall, Picasso, and many others. As the collection kept growing, the effort eventually led to the opening of Guggenheim Museum in 1959 at its current location on Fifth Avenue in a building designed by famous architect Frank Lloyd Wright. While in Europe, Peggy opened Guggenheim Jeune gallery in London in 1938, an unfortunate time, as WWII was about to break out the following year. Peggy had traveled to Paris the year before to secure art for the opening show. She had hoped to open the gallery with an exhibition dedicated to Constantin Brancusi, but the Romanian sculptor was out of town at the time, and Peggy turned her attention to Jean Cocteau. Guggenheim Jeune opened in January 1938 with a show dedicated to Cocteau – the gallery would close in August 1939 due to the war outbreak. In fact, Peggy had plans to open an art museum in London in the fall of 1939, when the war broke, and she had to return to New York. In June 1941 Peggy and her family sailed from Marseille to New York, bringing with them Peggy’s significant collection of modern art which included 150 works by artists such as Kandinsky, Klee, Mondrian, Braque, Miro, Dali, Magritte, Giacometti, Brancusi, and Max Ernst, works that could have not safely remained in Europe. At first, Peggy had hoped that the Louvre Museum in Paris might have sheltered some of the works, but the museum directors considered the art “too modern to merit saving,” as Prose relates. Back in New York, Peggy opened Art of This Century gallery, which shortly became the city’s cultural center. The gallery functioned from 1942 to 1947, when Peggy returned to Europe. Alexander Calder, Georgia O’Keefe, and Jackson Pollock frequented the space which was at once “a cultural landmark and a tourist attraction” (p. 137). Peggy helped launch Pollock’s career at Art of this Century – the artist showed four times at the gallery during its existence, and drew the attention of art critics such as Robert Coates at the New Yorker, and Clement Greenberg at The Nation. In 1943 the gallery hosted the first exhibition of collages in the United States. Also, “among the most remarkable aspects of Art of This Century,” writes Prose, “was the unusual amount of attention paid to women artists” (p. 140). She goes on to say: “equally striking is how few of these women – Frida Kahlo, Louise Bourgeois, and Leonora Carrington – went on to develop careers and reputations remotely approaching those of their male contemporaries” (p. 141). In addition to promoting emergent artists, as Prose relates, the gallery “was used as a background for fashion shoots in Vogue and Glamour, and was the subject of a photo feature in the New York Times Magazine” (p. 138). In 1947 Peggy returned to Europe, and bought Palazzo Vernier dei Leoni in Venice. Her collection was swiftly included in the 24th Venice Biennale in 1948, one of the most prestigious art shows in the world. Afterwards, the collection traveled to Florence, Milan, Amsterdam, Brussels, and Zurich, before returning to Venice in 1951, and being permanently housed at Palazzo Vernier dei Leoni. Among luminaries spending time with Peggy while in Venice, Prose mentions Surrealist painter Marc Chagall, Beat poet Allen Ginsberg, and experimental composer John Cage. In 1969 Guggenheim Museum in New York showed a large part of Peggy’s collection, which remains one of the most important in the world. To learn more about Peggy Guggenheim Collection, visit https://www.guggenheim.org/artwork/site/peggy-guggenheim-collection. Adam Cohen. Photo Credit: John Merriman. Contributed Photo. Adam Cohen earned his BFA at Philadelphia’s Tyler School of Art at Temple University. He also studied abroad in Rome. Using Photo Shop 1, Cohen was one of the very first artists ever to use the computer for art-making, launching his career as a top illustrator. He worked for clients such as Disney, Visa, MasterCard, Coca-Cola, CBS-TV, McGraw-Hill, Pfizer, Orion Pictures, Verizon, AT&T, The Atlantic Monthly, Dean-Witter, The New York Times and others. In 2015 Adam’s painting Intuition was selected among the finalists in the Art Olympia International Competition held in Tokyo, Japan. Judges from prestigious art institutions in the United States, France, Japan and other countries looked at 5000 entries from all over the world in two categories: Open Category, and Student Category. Eighty works, including Adam’s Intuition, were selected for the final. Also, in 2015 Adam signed a contract with Morren Galleries to be represented in the Netherlands. 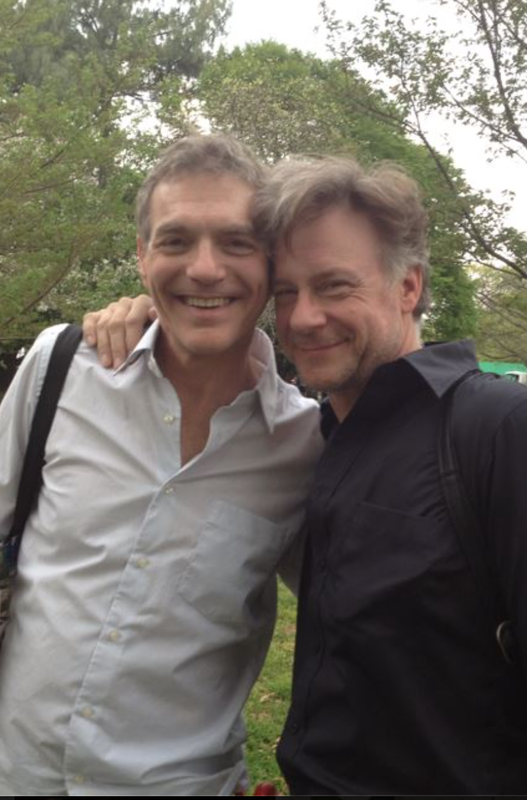 Simona David: Adam, you have formal training as a painter – you studied at the Tyler School of Art in Philadelphia. When did you start painting? SD: When did you switch to abstract painting? AC: About three years ago. I was feeling lost, and got the feeling that there was something else that I wanted to express, but it wasn’t clear to me. In college I didn’t like abstract, and didn’t understand it. I wasn’t really interested in it. Everyone else was doing abstract painting, I was doing figurative. But students were doing these hideous abstract paintings, and the teachers were upset with them – it was the worst year of painting at Tyler. From 1967 until 1975 the work was amazing in the school. Those years were like a Renaissance in art. My class wasn’t living up to that. 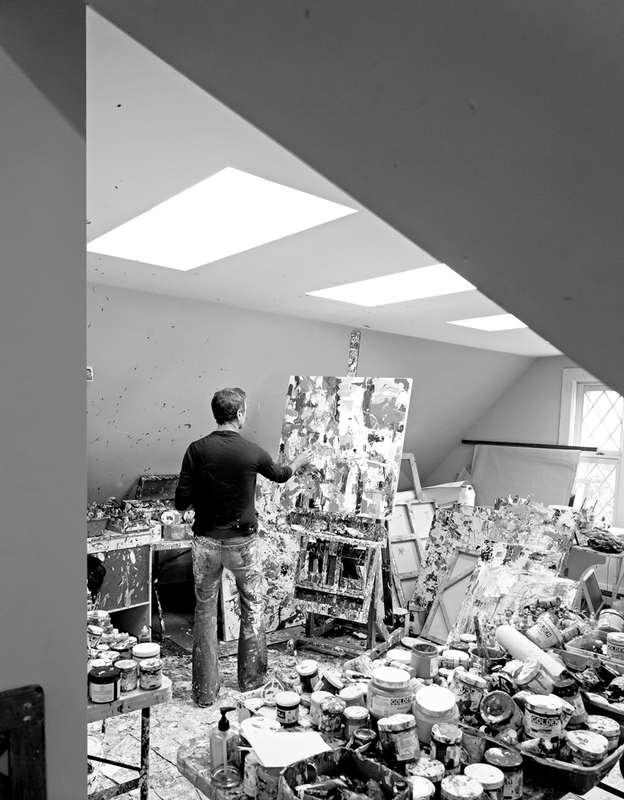 Adam Cohen in his studio. Photo Credit: John Merriman. Contributed Photo. SD: What painters did you like around that time? AC: I liked de Chirico. I liked Léger at one point. I never liked representational work. I prefer dream like, surrealist works. There is a mysteriousness in them. SD: Who is your favorite painter today? AC: I like Gerhard Richter. He’s a German painter. There are many things that I like about his work. He’s using a big squeegee to rub the paint. My approach is different. But I like a lot the early abstract painters. SD: These days you paint abstract only – Carter Ratcliff characterized your style as Gestural Abstraction. Let’s talk about your toolbox: what materials do you use in your work? AC: I use acrylics, some oil paint. I work mostly on canvas, and some wood panel. I go to art supplies stores and buy gels that I mix in my own formula. SD: Let’s talk a little bit about your style. AC: I’m an intuitive painter. But I can always do what I did as well: once you know that it’s part of your language. Carter said that I’ve taken every nice thing from every earlier phase and carried with me what I thought was the best. I do a lot of line work, and cutting, and slicing through the paint. I’m doing all this vascular work: the paintings are very much sculptural; they look visceral. SD: How do you name your paintings? AC: My partner, John Merriman, who does PR for celebrities, usually steps in and captures both my inner drive and the mood that a certain work of art is set to convey. Sometimes he even tells me when the work is done, although at night I may sneak back in the studio and add a few more brushes. Adam and John. Contributed Photo. SD: Adam, what inspires you? You divide your time between New York City, the Catskills, and Ocean Grove, NJ. Are there any external sources of inspiration or just inner experiences that trigger your creativity? AC: Consciously or unconsciously the environment influences me. For example, this winter was so long, and I painted Early Spring a few days before the equinox – I was dreaming of spring, hence these colors: reds, pinks, oranges, greens and blues. I spend a lot of time on Instagram these days. For instance, this painting was inspired by a photo I saw on Instagram with shimmering flowing water. I wasn’t trying to copy, but rather use these reds in a way that inspired me. There is also an internal color palette that changes for me. It’s a little mysterious. For example, I go to my studio in a particular week and for some reason there is a color that I feel attracted to. I don’t question why I’m feeling drawn to that particular color. But then, as I start to work, a whole color palette emerges. And then I realize that I want to do the same color palette in the next painting, and the next, and the next, like I can’t get enough of it. Maybe a month or so I’m in love with this color palette, and then all of a sudden that changes. I see paintings as living experiences. And to me they need to have a life of their own, and energy. I think Carter Ratcliff put it best when John asked him one day what makes a great work of art. Carter said “if I was going to use one single word, I would say that it’s inexhaustible.” When you look at it, there is no beginning, and there is no end, and you always discover new things. He once said about my work that the entire surface was connected and alive. I like how he brings definitions to me about something I can’t define. The intuition and the experience come first, but then you need someone to define it. However, once I do define something, and it really resonates with me, I look for that experience in it. SD: What kind of message would you like people to find in your work or you’re not concerned about that? AC: It’s that kind of question that people have: how do you know when it’s finished? It’s such a deeply personal feeling, and so critical. Yes, I want the surface to be connected and alive, and the painting be inexhaustible, and look at it forever and still find something you haven’t seen before. It’s almost like a magic trick. SD: You mentioned Carter Ratcliff before. He wrote a beautiful essay about your work. “A painting by Adam Cohen is like a sudden burst of light,” he said. AC: Carter was actually the closest to my very private and personal experience, and the decisions that I’m making in the process of painting. It felt like he was right there in the room with me, but he’s never been there. He interviewed me, but he was never there. He got the process so right. 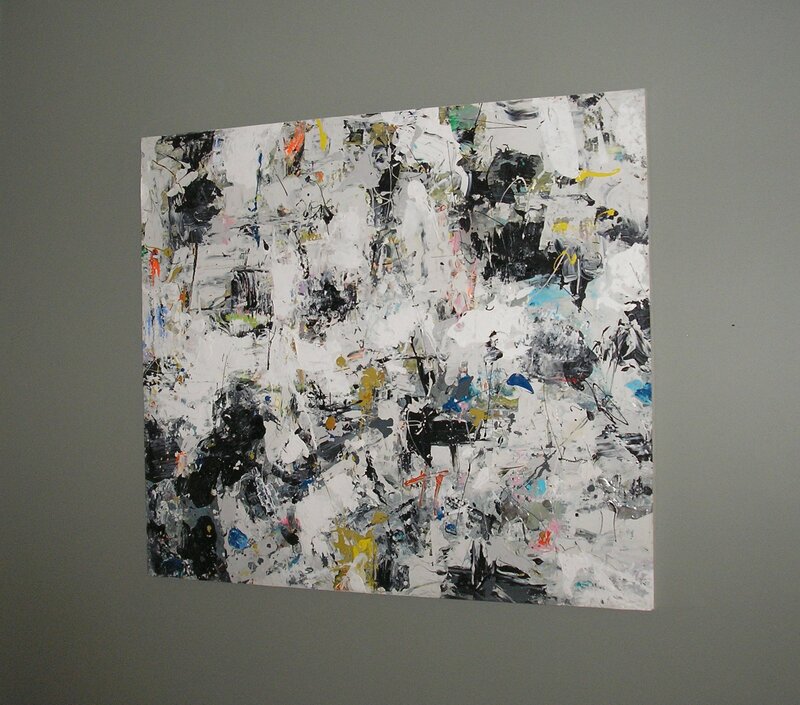 In his essay Carter said that the viewer looks at the painting and tries to look back at how the painter painted it. SD: That’s right. 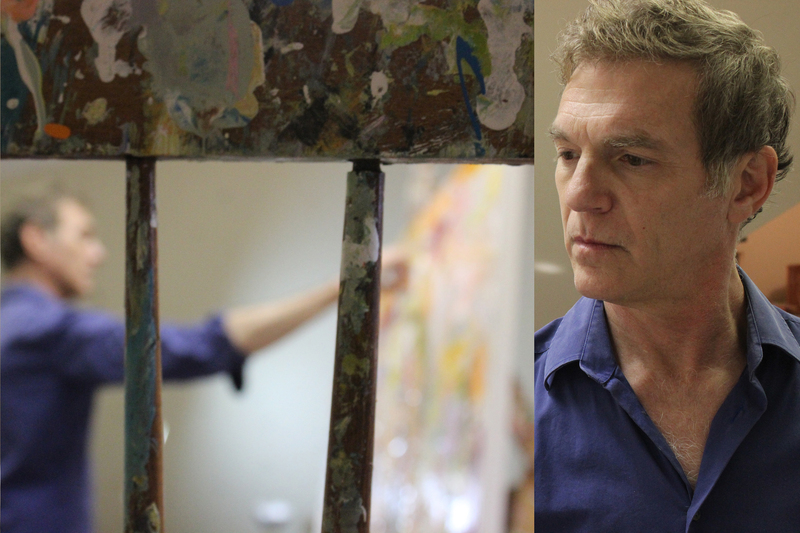 The artist starts with a blank canvas, and keeps adding to it. The viewer sees the final product, and strives to understand the artistic process that led to that accomplishment. AC: It’s a little bit like a maze. Really the entire world is abstract. The closer you get to anything that you magnify – your skin, a table, a rock – it’s abstract; everything is abstract and our eyes pull it together. I think it’s very natural to create that way. If you go very close to a Renoir painting you don’t see something that looks like a face or a shirt or an object on a table. You see all these very abstract marks. If you get really close, you can see every brush mark. It’s extremely abstract. You have to step back ten or fifteen feet, and then it comes together. SD: Let’s talk about your contract with Morren Galleries. AC: I signed a contract with Morren Galleries to be represented in the Netherlands. They have four galleries. My work is shown in Amsterdam. I have five paintings there: Infinity Blue, which was done by the ocean, and November Moon, done in November during the full moon. Usually John names my paintings, but this one I named myself. There is also Spring Sequence, which I named myself, and Mystic Marsh, named by John. I’m the first abstract painter to be shown in Morren Galleries in Amsterdam. 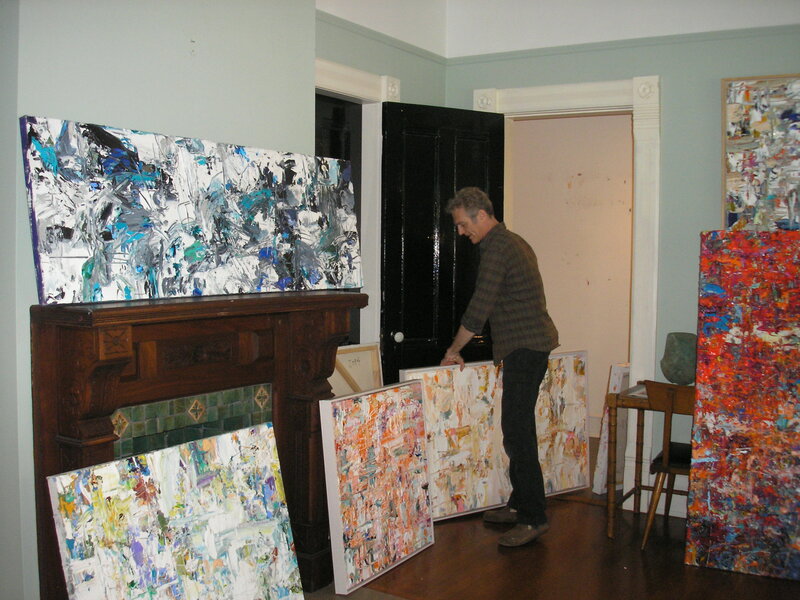 SD: You are getting ready for a show at Carrie Haddad Gallery in Hudson: Abstraction, opening date July 18. Let’s talk about that. AC: I have nine paintings in this show, including Paleolithic, Reflecting Pool, Enchanted, Clairvoyant, and Dragon Fly. Abstraction is a group exhibit showing the works of five artists, including mine. There will be a reception on Saturday, July 18 from 6 to 8 pm. I invite everyone to come. 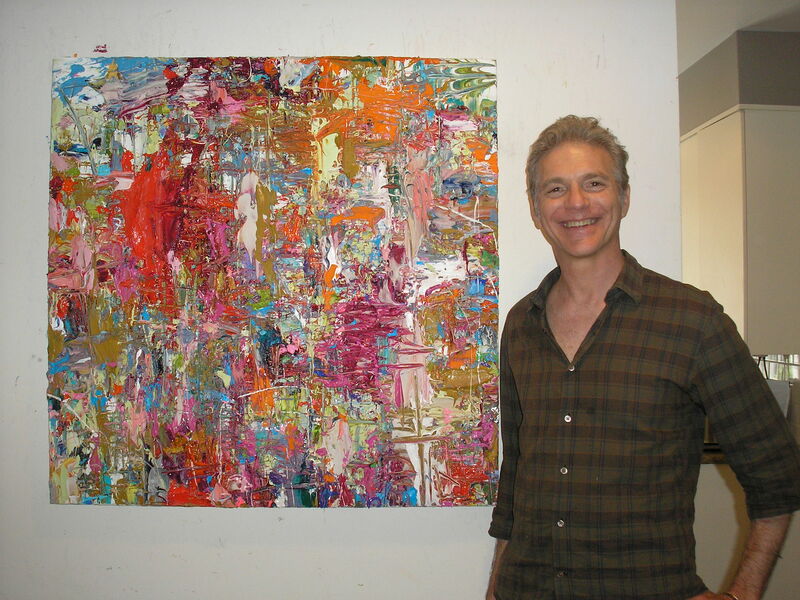 To learn more about Adam Cohen, visit http://www.adamcohenstudio.com/. And, an Exquisite Corpse Surrealist-inspired art project at Catskill Art Society in Livingston Manor. Read full article at Upstater.com.